I don’t know why, but whenever I think of the demonology spec I think about that movie and I think back to the Burning Crusade when it was common to see a warlock running around with a Felguard in tow. Many Dark Art practitioners during BC enjoyed leveling as a demonologist mainly for the pure joy of commanding one of these big guys while it tore their enemies apart. Felguards can grab aggro like a tank, crank out some decent dps, stun, smack multiple mobs around with a big AoE, and to top it all off they can easily chase down a fleeing scared mage target. So will there really be a changing of the guard? Or should I say of the Felguard? When MoP launches in less than two months, I have a strong feeling you’ll be seeing a large influx of demonology students working towards mastering the new play style of this old specialization. The new changes to the demo spec are too shiny and too exciting not to pass up. So as both a refresher for me (since I’m not as skilled in Demo as I should be), and hopefully to help inform you…this week we’re going to examine the benefits of summoning the old faithful Felguard, and the new, sleek, Wrathguard. Axe toss – An instant 30 yd range attack on a 30 sec global cooldown. The Felguard throws his axe at your target stunning them for 4 seconds. Some people use this as an opening attack before unleashing the power and glory of yummy warlock pain on their victims, and some save it because it’s good for stunning any adds who decide they want to play “pile on”. If you’re out of range from the target when the spell is cast your Felguard will run towards the mob to the 30 yard range to toss his axe, and then he’ll immediately return to your side unless commanded to do otherwise. In Beta, the second you use Axe Toss on a target the demon starts attacking it immediately. I’m not sure if this will stay this way or not. Legion Strike – This is the basic and standard attack for the Felguard. This melee attack causes weapon damage + an additional 2862 damage to all nearby targets within 6 yards. The weapon damage is divided by all targets in that range. The targeted mob either by itself or in a group becomes wounded, which reduces any healing effectiveness on that mob for 5 seconds. Felstorm – A hard hitting AoE melee range attack with a 45 global cooldown. This ability hits all targets in an 8 yard range for weapon damage along with 3488 damage every 1 second for 6 seconds. Pursuit – works within an 8 – 25 yard range on a 15 second global cooldown which allows the Felguard to charge their enemy causing weapon damage and increases the Felguard’s movement by 30% for six seconds. Axe toss – An instant 30 yd range attack on a 30 sec global cooldown. The Felguard throws his axe at his target stunning them for 4 seconds. Currently, Axe Toss has no changes from Cataclysm to Beta. Legion Strike – A basic sweeping melee attack where the Felguard causes weapon damage to all nearby targets within 6 yards. The weapon damage is divided by all targets in that range. The main target in the group becomes wounded, which reduces any healing by 10% for 5 seconds. This spell has had a few small changes from the Cataclysm model, but not enough to QQ about. Felstorm – A good AoE melee range attack on a 45 global cooldown. This ability hits all targets in an 8 yard range for 150% weapon damage every 1 second for 6 seconds. Another very small and very slight change from it’s former self in Cataclysm. The spell is the same as in Cataclysm with only a few tweaking of the numbers. Pursuit – works within an 8 – 25 yard range on a 15 second global cooldown. With Pursuit, the Felguard charges their enemy causing 150% weapon damage and increases the Felguard’s movement by 30% for six seconds. This is another good opener to consider or good for a chasing fleeing enemy. Pursuit did get a slight change in the positive with the addition of the weapon damage added to this skill. Is it huge? Sadly, no. Is it extra damage? Heck ya! When you hit level 75 in MoP, you’ll have the option to choose the talent the Grimoire of Supremacy which allows the warlock to “upgrade” their old demons into the new ones. It’s also important to remember by choosing this talent, the GosSup demons will automatically have an increase to their health and dps by 20%. By selecting this talent, a master of demonology will change or “upgrade” their standard Felguard into the new pimped-out model, the Wrathguard. Sadly, other than looks and a few small tweaks to damage numbers there will not be many changes between the Felguard or the Wrathguard. Avoidance – reduces AoE damage by 90% – All demons, including the standard and GoSup versions, have this as a passive talent. 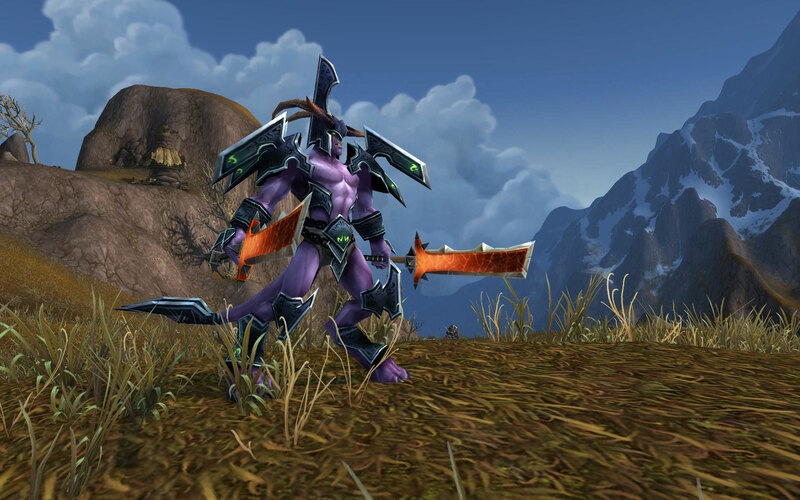 Dual Wield – (sorry, but no link listed in the Wowhead database) Allows all weapons to be equipped in the off-hand of the demon – Only the Wrathguard currently has this ability. This has been added because you will be able to use a glyph to change the looks of your both your Felguard and Wrathguard’s weapons. Fel Energy – All demons use this new resource like the older mana system. Demons will gain 10 Fel energy per sec up to a maximum of 200 Fel energy. All demons, both the standard and the new GoSup ones, have this passive. Void Reflexes – This passive ability increases the demon’s chance to dodge by 10%. This passive is also shared by our Voidwalkers and Voidlords to help aid in tanking. Axe toss – An instant 30 yd range attack on a 30 sec global cooldown. The Felguard throws his axe at his target stunning them for 4 seconds. 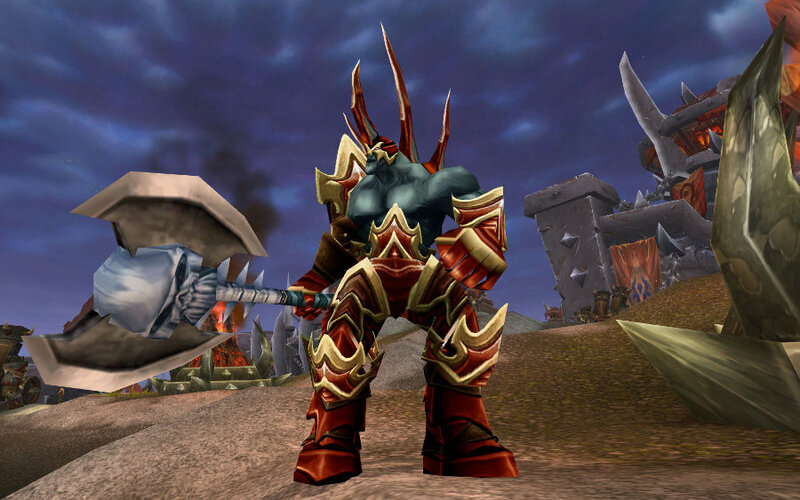 In Cataclysm, the Felguard will throw his axe to stun, but he will not attack until you command it. 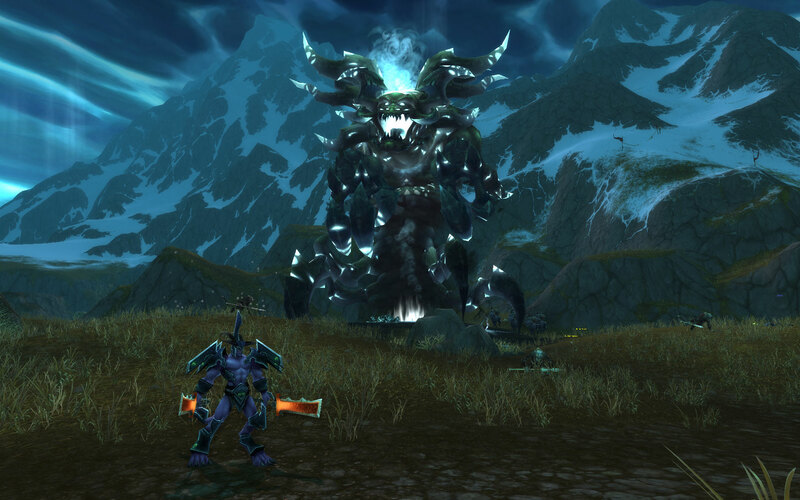 In MoP Beta, both the Felguard and the Wrathguard will both auto attack immediately after using this skin. I’m not sure if this will stay this way or not. IMHO, I prefer they do nothing until you command them to attack. Mortal Cleave – This is the new Legion Strike replacement and has received a slight change other than just it’s name and that it helps build your new resource, Demonic Fury. Each successful use will build 12 Demonic Fury which is the resource needed to utilize Metamorphosis. Mortal Cleave will remain as a basic attack where the Felguard causes weapon damage to all nearby targets within 6 yards. The weapon damage is divided by all targets in that range. The main target will also get smacked with a 25% healing debuff for five seconds too. The healing debuff on the main target is a slight increase up from the previous 10%. Wrathstorm – The new replacement to the former Felstorm. A good AoE melee range attack on a 45 global cooldown. This ability hits all targets in an 8 yard range for weapon damage every 1 second for 6 seconds. It might have a different name, but it’s the same old Felstorm with a different skin. Pursuit – Stays exactly the same as it’s former Cataclysm version. It has an 8 – 25 yard range on a 15 second global cooldown where the Wrathguard charges their enemy causing 150% weapon damage and increases the Felguard’s movement by 30% for six seconds. Another view to see the new Wrathguard model. The swords are animated too, and sadly this picture doesn’t do them justice in how cool they look. If you haven’t read about the new Command Demon ability, it’s basically taking the strongest spell from of our current summoned demon and allowing warlocks to put it on their action bar. For the Felguard the spell of choice is the Felstorm, and for the Wrathguard it will be Wrathstorm. One of the minor glyph choices for warlocks in MoP will be the Glyph of Felguard. With this glyph, both the Felguard and the Wrathguard will equip a random two-hand axe, sword, or polearm from your backpack. 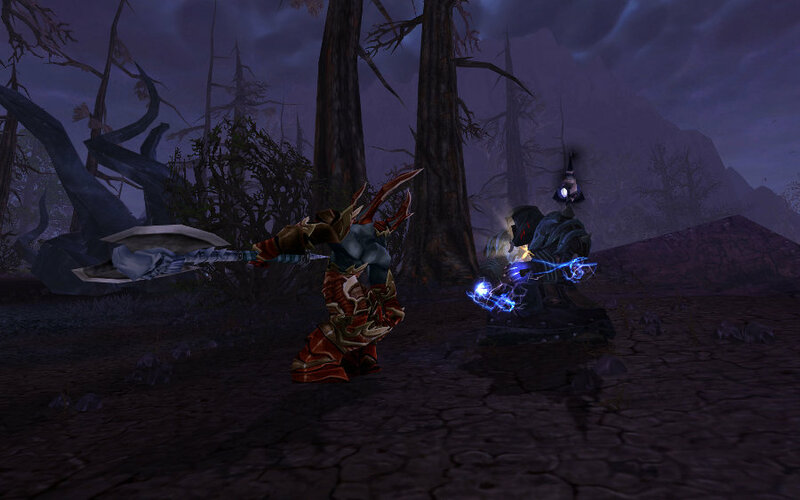 For the Wrathguard, Blizzard has also added the passive ability called Dual Wield, which allows all weapons to be equipped in the off-hand of the demon too so that the Wrathguard can of course…dual wield. I really like the idea of allowing players to “tweak” the look of their demons and I hope this becomes expanded upon. As it appears to me, it’s just kinda “meh”. Yes, it is a cool feature and I think the idea is sound, but the implementation of it falls flat IMHO and here’s some reasons why: The Shivarra dual wields, but you can’t change her weapons and why stop at just changing the look of the weapons only? I love the concept of personalizing your demons. It would open up so much more flexibility and freedom in character customization. What if you could change the color of your Observer from blue to red or any other color? Instead of 12 eyes, what if you could select a specific look like the character customization screen when you create toon? How about a Fel Imp without the horns or piercings? I guess my biggest gripe is that there are so many different ways Blizzard could have gotten creative with customizing our demons and this just seems bland. Even if Blizzard implemented and made such varied customization into a gold-sink, I know players would be frothing at the mouth to hand over their gold for that kind of change and personalization for their demons. Look at what transmogging has done! 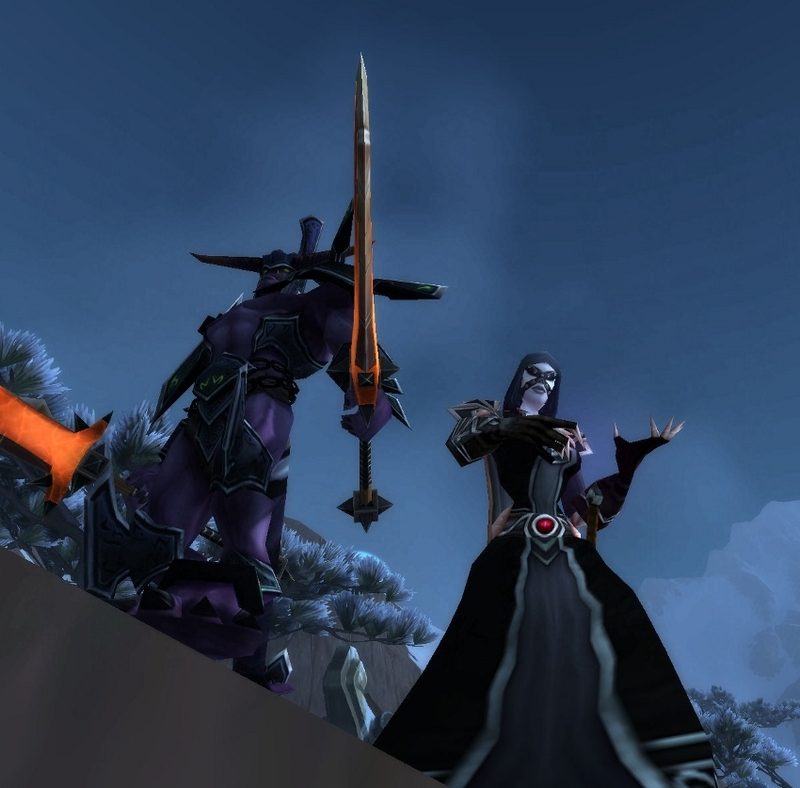 So will there be a changing of the guard for demonology? Should you use the Felguard or the Wrathguard? Is there a clear difference between the two? No, there isn’t much of a sizeable difference between the two other than the fact that the Wrathguard will have more health and higher dps from the GoSup talent. However, choosing one of the other level 75 talents and using the standard Felguard might work better for different situations, but at this time it’s still a “wait and see” for what MoP will bring. *Sighs* September 25th, just can’t get here fast enough for me. Over the next post or two, we’ll be looking at our last two demon choices for warlocks and their new upgraded versions provided by the GoSup. Yep, we’ll be looking at our single target burn’em phase friend, the Doomguard, and our AoE fiend, the Infernal. As always, I’d love to hear your thoughts and ideas. So please feel free to let me know what you think! My baby lock is demonology, and I’m really digging the changes here. I love the way the Felguard just does all the work for me….wait did I just say that.